Good starting positions for the Porsche 911 RSR at the Daytona 24-hour race: The 510 hp race cars from Weissach fielded by the Porsche GT Team take up the world-famous long distance classic in Florida from the second grid row on Saturday. In the qualifying session for the storied season-opener of the IMSA SportsCar Championship and the North American Endurance Cup, Laurens Vanthoor (Belgium) clocked the third quickest time in the GTLM class with the number 912 car – a mere 14-hundredths of a second off the pole-setting time. His teammates are the two-time Le Mans overall winner Earl Bamber (New Zealand) and Gianmaria Bruni (Italy). 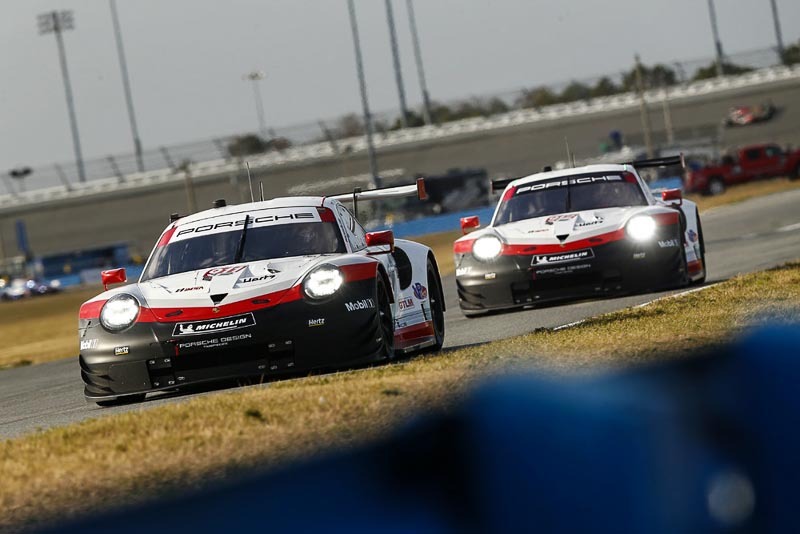 Patrick Pilet (France) posted the fourth quickest time on the Daytona International Speedway at the wheel of the #911 Porsche 911 RSR, which he shares with outright Le Mans winner Nick Tandy (Great Britain) and Frédéric Makowiecki (France). The first qualifying of the season underlines just how fierce the competition will again be in the 2018 GTLM class: the top eight cars qualified within eight-tenths of a second. The race starts on Saturday at 14:40 local time (20:40 CET) and can be watched live outside the USA on www.imsa.com.